When was the last time you looked into AC repair Spring Texas? Texas is notorious for its high temperatures, especially in the summer months. A faulty air conditioner can quickly ruin your day, or even your entire week. It always takes more time to fix a broken air conditioning unit than to repair a working one. You should hire a professional to examine your AC unit at least twice a year. This way, you can ensure it will run smoothly when you need it to the most. In some cases, you will need to repair your air conditioning in Spring, Texas between inspections. Some homeowners are unaware of the signs that your unit is potentially damaged. Others may ignore the early warning signs, believing them to be unimportant quirks. Learning about your AC unit, including when it needs repairs, is a crucial part of responsible home ownership. A faulty unit will not only overheat your home and your family, it can be dangerous. Hundreds of house fires happen each year because of faulty appliances, including AC units. If you need air conditioning repair in Spring, Texas, contact Houston Admiral Air Conditioning and Heating. They are proud to offer their customers 24-hour service. Houston Admiral only employs the best and most qualified technicians in the Houston area. There are no extra charges for skilled labor or work completed after hours or on weekends. They are also happy to offer a 10-year warranty on all parts and labor. These perks are unmatched by any other competitor in the area. You can learn more by contacting their friendly customer service team at 281-876-9400. Prospective customers can also visit their website at https://goadmiral.com. Take a look at the signs that you need repair below, and contact Houston Admiral today. Airflow problems are one of the first signs that you need air conditioning repair in Texas. The most common issue regarding airflow is with respect to its temperature. When your air conditioner needs repair, it often fails to produce cool air. You may notice that the air pressure remains constant, but the air itself is of an inconsistent temperature. This can be the first sign of any number of problems. In most cases, a qualified repair person can fix this issue fast if contacted right away. Letting a problem like this sit for too long often results in more expensive repairs. Another common airflow issue involves the amount of air the unit generates. It may still be cool, but there is an insufficient amount of pressure. As a result, only one or two rooms in your home receive cold air. This can be a problem with the compressor or duct work. The best way to find out is to contact a qualified repair service. They can send a technician to your home. This individual will assess the situation and provide you with recommendations. Residence of Spring, Texas who need AC repair can contact Houston Admiral Air Conditioning and Heating. They are happy to offer their customers access to the best parts and labor in the area. Houston Admiral provides a 10-year warranty on both parts and labor. They do not charge their customers hidden fees for weekend or after hours visits. Instead, they strive to exceed your customer service expectations. They have been in the HVAC repair industry for over 50 years. As such, they know how to treat their customers right. You can learn more by contacting one of their customer service agents at 281-876-9400. Interested consumers can also visit them online at https://goadmiral.com. Some air conditioning units will make a lot of noise while running perfectly fine. Excellent performance does not always mean you do not need AC repair in Texas. In fact, a machine that suddenly starts making noise while continuing to push out air could be dangerous. Electrical fires can start because of a malfunctioning appliance. Squealing noises often mean that a technician needs to replace or lubricate a metal part. Grinding noises usually mean that there is something wrong with the belt or bearings. A skilled technician can easily and quickly replace these items. You should pay close attention to the odors your air conditioning unit emits. If you notice bad smells coming from your machine, turn it off and contact a repair service. Smells like these usually indicate problems with the wire insulation. Letting the unit run with faulty wiring will result in damage to the unit, and potentially your home. Foul odors can also indicate mold growth within the machine itself. It is safest for you and your family to hire a qualified technician to address these issues. 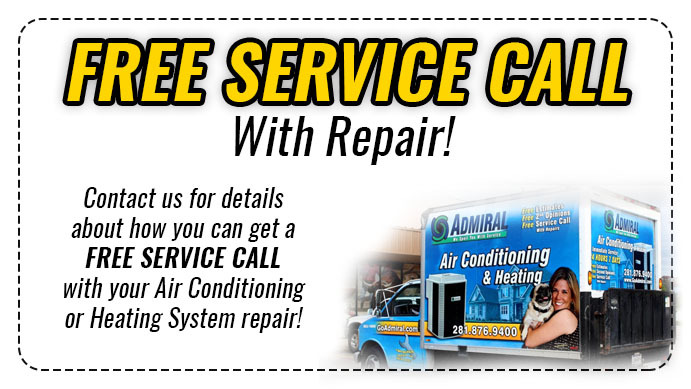 Homeowners in Spring, Texas can contact Houston Admiral Air Conditioning and Heating for their repair needs. Houston Admiral has over 50 years of experience in the field. They have a long history of happy customers and are proud to bring the same service to you. Prospective customers can learn more by contacting them at 281-876-9400. You can also visit them online at https://goadmiral.com to learn more about their services. You should inspect your air conditioning in Spring, Texas if you notice moisture. Unusual or additional moisture around the unit itself may be refrigerant leaks. These leaks are serious issues that can affect your family’s health. They can also be hazardous to any pets or small children. Leaks may also be the result of a blocked or broken drain tube. This is a much less serious problem, but one that needs attention from an expert nonetheless. 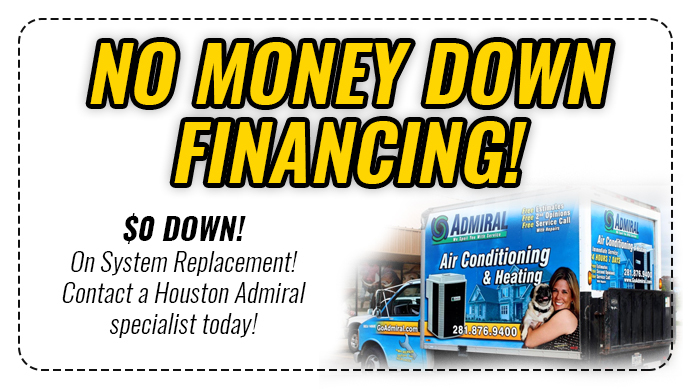 Homeowners looking for AC repair in Texas can contact Houston Admiral Air Conditioning and Heating. They have over 50 years of experience in the field. This gives them the ability to quickly and accurately identify and fix AC issues. If you think you need air conditioning repair contact them by calling 281-876-9400. Prospective customers can visit them online to learn more at https://goadmiral.com. If you are searching for the best AC repair Spring Texas, contact Houston Admiral today.